The goal of this report is to propose a strategy and indicators for monitoring social inequalities in health. It is the result of a joint effort on the part of regional and national surveillance professionals in Québec, from the Table de concertation nationale en surveillance, the Ministère de la Santé et des Services sociaux and the Institut national de santé publique du Québec. The report is divided into three parts: the first presents background information and useful concepts, the second reviews points of method, and the third formulates recommendations for a strategy and indicators to be used to monitor social inequalities in health. To initiate the monitoring of these inequalities, the report proposes 18 indicators covering the health status of the population (10 indicators) and health determinants (8 indicators). These indicators are to be cross-referenced with a deprivation index, primarily, and tracked over approximately two decades on a Québec-wide scale and for each of Québec's administrative health regions. 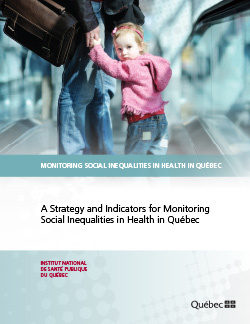 Using the inequality measures proposed, it will be possible to monitor social inequalities in health, in relative and absolute terms, between certain population groups and in the overall Québec and regional populations.